After a few years in development, Intel formally unveiled its next-generation data transfer interconnect. The new Thunderbolt standard represents a shift in the underlying technology--and a potential shift in how we can do things down the road. Thunderbolt began as a project out of Intel Labs, and was originally conceived as an optical technology, with optics in the cable as well as the device host controllers. That technology was codenamed Light Peak, and debuted at the Intel Developer Forum in 2009. The idea, explains Jason Ziller, director of Thunderbolt planning and marketing, was to create a single cable that supported high-speed transfers and multiple protocols, to address the explosion of data storage thanks to high-definition video and other digital media formats. As recently as CES 2011, though, manufacturers were not optimistic about Light Peak surfacing anytime soon. And then the rumors surfaced about Intel switching away from the optical connector. Which brings us to the unveiling of Thunderbolt. Gone is the “light” of Light Peak, as Intel moved away from the all-optical approach, because the costs on the host controller side were still too high for their PC OEMs, this in spite of the prices having come down over the course of development. Instead, Light Peak morphed into Thunderbolt, a high-speed, dual-protocol interconnect which uses an electrical copper wire. A Thunderbolt cable and connector. That wire, together with the Thunderbolt host controllers, can deliver up to a mind-boggling 10Gbps across Thunderbolt’s two channels. Thunderbolt supports both the PCI Express (PCIe) and DisplayPort protocols. Intel says it chose PCI Express because of its flexibility; and it chose DisplayPort because it’s optimized for use with PCs (however, you can use a connector to convert a Thunderbolt cable to HDMI). Each wire carries two independent bidirectional channels, so that translates to a total of 40Gbps maximum. Bandwidth can be split across multiple devices, as Thunderbolt--like FireWire 800 before it--supports daisy-chaining, in this case up to 7 devices. The only thing lost by going to copper, he added, is the support for long wires; the copper cables are limited to 3 meters in length. For those who do need the extra length, though, longer optical wires will be available. “We haven’t abandoned the idea of a light connection,” says Ziller. “We still believe optics is in our future, and it will be necessary in our future. We’re still doing research and development into that.” Electrical isn’t dead yet, but it will reach a dead end. In demos during Intel’s unveiling, we didn’t actually see the data reach 10Gbps, but nonetheless, the speeds were impressive, topping out at about 8Gbps. First out the gate with product, as has already been announced, is Apple, which includes aThunderbolt port on its new MacBook Pro models. If Thunderbolt delivers on its promises in the real-world, though, it looks set to overtake competing high-speed storage interconnects, USB 3.0, eSATA, and FireWire 800. The chart below shows just how Thunderbolt compares; and on paper, it looks quite good. Some additional benefits include the fact that it takes the stress off the CPU for data transfers, thereby letting you use your machine to do other tasks while a transfer occurs in the background. Media creators will appreciate Thunderbolts low-latency, high-accuracy 8-nanosecond sync time across all daisy-chained devices. This means that you can match each frame on all of the devices you’re working on through real-time processing, so each device is on the same frame. The time management unit is built into the Thunderbolt controller on each device, so they can talk to one another and synchronize accordingly. Thunderbolt is compatible with displays based on DisplayPort 1.1 and later, and uses a connector that’s based on mini-DisplayPort. Unfortunately, not many users have DisplayPort. Apple uses DisplayPort, of course; and a handful of monitor makers use it on high-end models aimed primarily at the business and professional markets. Consumer monitors continue to rely on DVI and HDMI, though there is always a chance now that Thunderbolt is a reality, it will help spur more monitor makers to adopt DisplayPort. Ziller didn’t address when we might see USB 3.0 adoption in their chipset; nor did he address when Thunderbolt technology might be seen in Intel’s own chipset, although he did theorize we might see it in PCs by early next year (based on the SDK becoming available this summer). That means that Apple has a huge jump on the market--although no one will be able to do anything with Thunderbolt for a while, at any rate. In addition to those storage companies, high-end professional audio-visual purveyors like Aja, Apogee, Avid, Blackmagic, and Universal Audio have announced support for Thunderbolt as well. 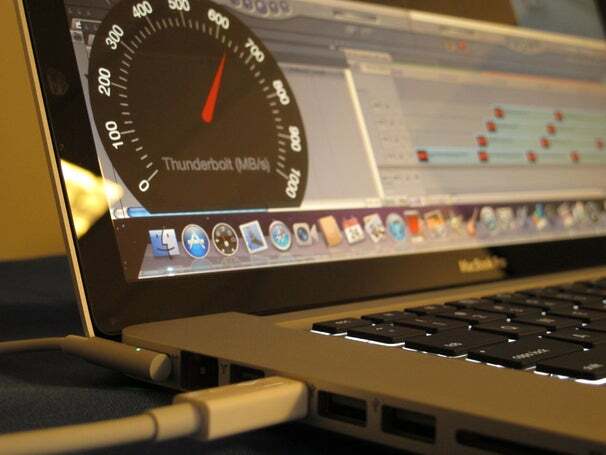 The first adopters of Thunderbolt are likely to be media creation professionals. Given what Thunderbolt enables--namely, multitasking, and time-syncing--it’s not surprising that those companies are involved. Thunderbolt could easily transform moviemaking and post-production chores, for example. Where Does Thunderbolt Fit in For Storage? The reality is that Thunderbolt is, in its first year, going to mainly appeal to media creators working in video- and audio-editing tasks. There’s no real threat to USB 3.0, simply because, in spite of its compatibility with PCI Express and DisplayPort, Thunderbolt has no established ecosystem of products it’s trying to work with. I see more of a threat to FireWire, which also saw benefits from daisy-chaining; but that’s in the long-term. For now, Apple continues to include FireWire ports, so that interconnect isn’t a goner just yet. The other reality, though, is that consumers will very much want and need Thunderbolt. As households increasingly accumulate digital media--be it high-definition or high-megapixel--we increasingly need to manage our own data centers, which will make welcome any time savings Thunderbolt can provide. No one likes to wait for data to transfer--it’s why a decade ago CDs continually tried to push the envelope to achieve faster transfers; and it’s why even today many data management tasks for hard drive-based data get back-burnered because of the time involved. It makes sense that Thunderbolt debuted on Apple’s MacBook Pros. Perhaps more than any other devices, the Apple’s MacBook Pros have a high reputation among media creation professionals. And kudos to Apple for having the foresight to launch products with Thunderbolt, even though actual products will clearly lag behind in availability. For Thunderbolt to take flight, we need to see widespread industry adoption in both business and consumer devices, across both storage peripherals and across systems. Furthermore, where Thunderbolt’s impact may be felt lies down the road, far into the future. Given a few product development cycles, the reality of Thunderbolt is that we may see new models evolve for audio/video production systems or super-speedy local data backup and archiving. Thunderbolt can even aid the transcoding of content, thanks to its compatibility with Intel’s Quick Sync Video. But first we have to get Thunderbolt out there and on devices. And that will take some time to ramp up. Once it does, though, we may all be speeding along--never again grousing about grabbing a cup of Joe while waiting for data to transfer.